FANTASY IMPERIUM by SHADOWSTAR GAMES This is my second illustration for the new role playing game Fantasy Imperium. 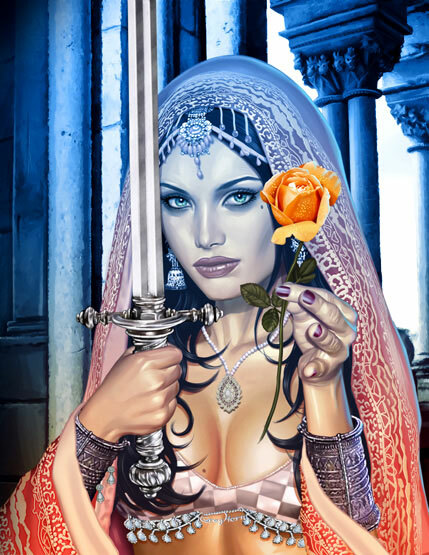 As you can see, she is offering you the sword or the rose. I'd take the rose if I were you-- unless of course, you enjoy getting your head split open like a ripe coconut! Fantasy Imperium is a new RPG game from Mark O'Bannon. This is the first of two illustrations I'll be providing for the manuals and modules, and as you can see this fantasy world can include some rather interesting characters! Anyway, I figure these fairies are frustrated because they are taking a cold shower here. You know, there are certain ways I could have depicted coldness, but I chose not to be naughty. Maybe I'll bring THAT version to the cons.